Many visitors to Amsterdam rent a bicycle to explore the city but very few venture beyond the city centre and make it out into the picturesque Dutch countryside. With such flat terrain, it is quite easy to plan a day trip to nearby towns or tourist attractions from Amsterdam. A light rain jacket as the weather around Amsterdam is notorious for changing quickly. You should also be in reasonably good physical condition. The routes are quite flat and generally the only challenge is the wind resistance, which can be quite strong if you have to bike into the wind. The follow are 3 recommended bike day trips that start near Amsterdam Central train station and return to that point. You can begin the routes from other points along the route that are most convenient for you. 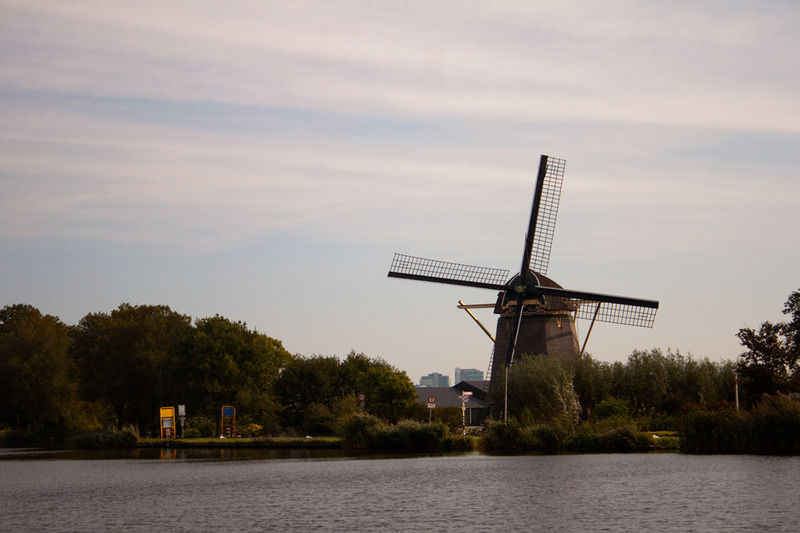 The windmills at Zaanse Schans are one of the most popular tourist destinations in The Netherlands. Situated along the Zaan River, the bike route requires riding outside of the Amsterdam city area, taking a free ferry across the IJ (pronounced “eye”), and riding through the town of Zaandam. The direct route from central Amsterdam is about 30km roundtrip by bike. A longer route of 45km to Zaanse Schans can be down that loops through the polders, land reclaimed from the sea, before reaching Zaanse Schans, then passing through the small towns of Westzaan and Nauerra before heading back to Amsterdam. Amsterdam’s castle, known as Muiderslot, is located at the mouth of the Vecht River, southeast of the city centre in the town of Muiden. 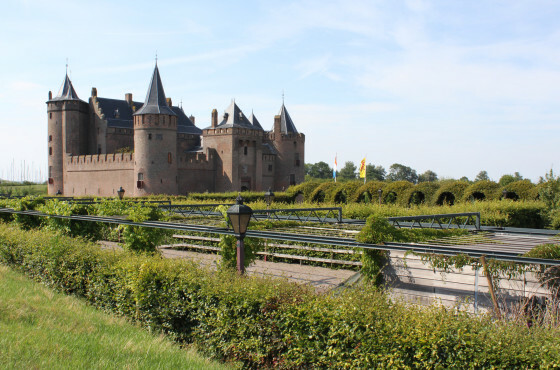 The 40km bike route from the Central Station area can be done in about 5 hours roundtrip, not including stops at the castle or any other attractions. The route follows the scenic Amsterdam-Rhine Canal before heading into the countryside and reaching the town of Muiden. 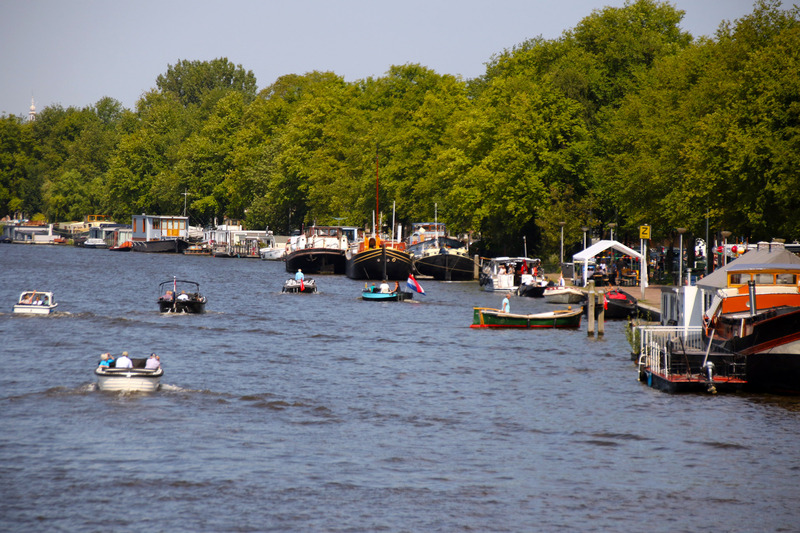 After visiting the castle, the route continues south along the east side of the Vecht River to the town of Weesp before returning to Amsterdam through the scenic Diemerbos, a forested area built in the 1990’s. One of Amsterdam’s most iconic rivers, the Amstel River (not the beer) flows through Holland, into the centre of the city. The 40km bike route known as the Amstel Ronde Hoeproute takes about 5 hours to ride and follows the Amstel out of Amsterdam, passing through Middelpolder park before crossing into the town of Ouderkerk aan de Amstel. The Rondehoep is a protected grassland area that is home to many different species of birds. The biking route loops around the Rondehoep before reaching the Amstel River and following it north, back into the city. If you are looking to rent bicycles while in Amsterdam, you can see a list of bike rental shops or read about the details of renting a bike. 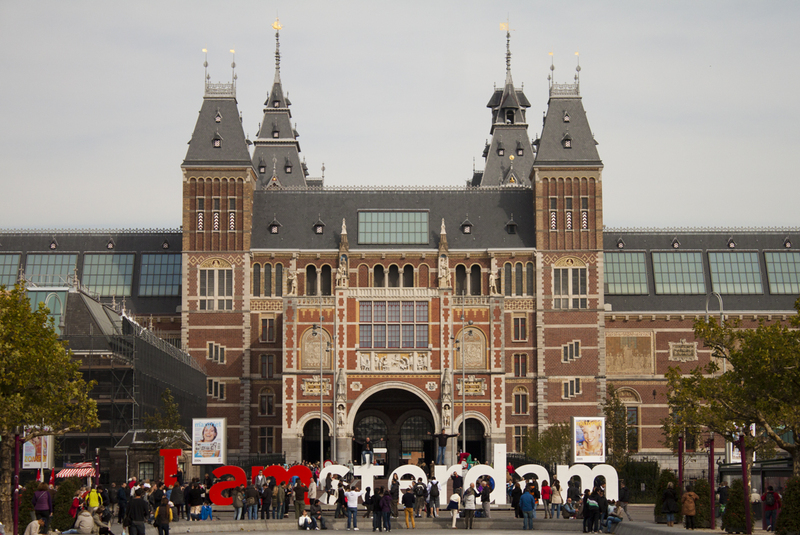 Amsterdam is one of the world’s most cosmopolitan cities, known for its rich history, culture, and arts. It’s also one of the best cities for biking, with its relatively flat land and extensive network of biking routes. Amsterdam is a very flat city and the only elevation gain you should expect is when you have to ride up a couple of meters over a bridge crossing a canal. Being so flat makes biking around Amsterdam a relaxing experience. You can cross the entire city quickly while barely breaking a sweat. You can also cover very long distances of more than 50km on a basic bike that will take you around the city and even out into the countryside to explore. While the terrain is flat, don’t forget about the wind. It can be a bit more challenging having to ride back to the city when the wind is blowing in your direction and such a flat country can often experience very high winds! The Netherlands has some of the best bike infrastructure in the world making it really easy to get around the cities and countryside by bike. 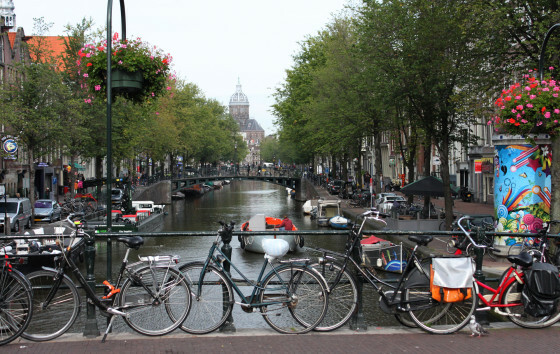 There are dedicated bike lanes and routes throughout the city of Amsterdam, dedicated street lights and crossing lights at intersections, and even dedicated bridges and bike / pedestrian ferries. Visitors to Amsterdam familiar with biking in their home cities are amazed by the infrastructure. Bikes are a major mode of transportation for the Dutch and the country has been set up for this. The first clue that there is a lot of bike infrastructure is when you see the multi-level, bike lockup area next to Amsterdam Centraal Station. You may also be fortunate enough to see someone moving all of their household belongs in the city by bike. With its canals, cafes, museums, history, culture, and architecture, Amsterdam is a great European destination and exploring it by bicycle makes the experience even more unique. You can plan to rent a bike for several days and use it to go between popular attractions like the Rijksmuseum, Van Gogh Museum, Anne Frank House, or even the Heineken Museum. You can book a guided bike tour of Amsterdam or choose one of the self-guided routes on Biking Amsterdam. Or, just simply ride around the city and explore, stopping at cafes and watching the busy streets and canals. The bikes routes are so good that they extend out into the countryside, well beyond the city limits, and even connect other Dutch cities and neighbouring towns together. 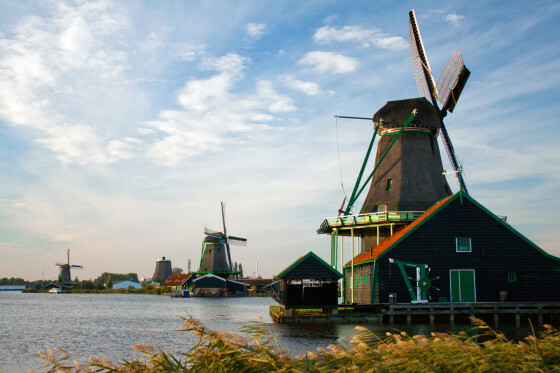 Visitors to Amsterdam can plan longer routes outside the city by visiting the iconic windmills at Zaanse-Schans or the Muiderslot castle at the mouth of the Vecht River. If you do plan on exploring outside of Amsterdam, it’s well advised that you plan your day by taking a map, having a fully charged mobile phone (and charger, just in case), food, and water with you. It’s amazing how quickly you can find yourself in the countryside and not near any cafes or conveniences. Nothing makes you feel more Dutch than riding a bike in Amsterdam. While there’s no way of knowing for certain, it’s estimated there is more than 850,000 bikes in Amsterdam. With a population of 780,000 people, that’s more than one bike per person! So, if you’re visiting Amsterdam, remember that renting a bicycle or taking a guided tour of the city are the best ways to explore and get a feel for the Dutch city. © Copyright 2019. All rights reserved. All content, photos and data are copyright by Biking Amsterdam.